I already finished “Driving Technical Change” a few weeks ago, but I got so caught up with other stuff that I almost forgot to actually sit down and write a review for it. I was very much looking forward to reading this book, and I must say that it certainly didn’t disappointed me. 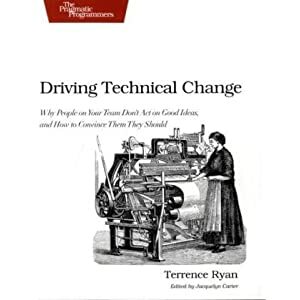 The author, Terrence Ryan, did a very good job distilling and capturing a good number of patterns and techniques for trying to convince people to adopt the concepts, tools and technologies that you yourself are trying to put forward. It’s not entirely gospel, but there is a lot of wisdom and definitely a number of great nuggets in there that might come in handy throughout ones career as a passionate software developer. There are three main parts in the book. The first part elaborates on seven skeptic patterns. These skeptic patterns describe a particular stereotype of humans that you might encounter in your organization or work environment that are opposed to your ideas in one way or another. The second part of the book provides a number of countering patterns and techniques that can be used to ‘massage’ these skeptic stereotypes so that they come more in line with your way of thinking. Some of these techniques are claimed to be universal while others only work on certain types of skeptics. The third and final part of this book then talks about some strategies on how to effectively apply these countering techniques and patterns. With the information laid out here you’ll able to sort out a good approach for taking action. With only a good 125 pages, this book is a concise collection of patterns and practices that are targeted towards influencing the people in your organization or working environment. This book is a highly recommended read when you want to push things forward at your work place.